Recently, I held a rather large giveaway with thousands worth in prizes. I asked all entrants (many were readers of my blog) the required question: What is your biggest financial frustration? 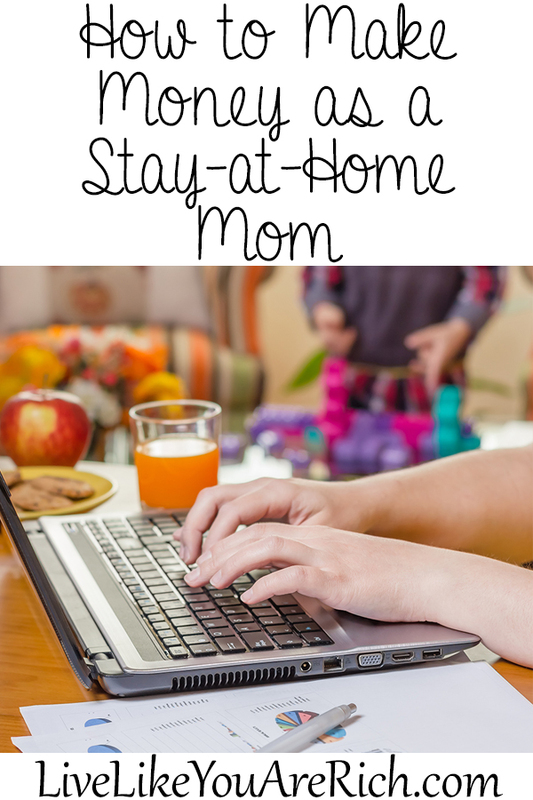 I was surprised to hear from so many Stay at Home Mom’s who wanted to earn money and work from home. They mentioned that their priority is of course their families but that they want (or in many cases desperately need) to help out financially as well. Multiple readers expressed interest in making a little (or a lot) of money while the kids are at school, while they nap, or when there is down time around the house. Others spoke of unfortunate circumstances (like medical emergencies and family hardships). Other’s spouses are unable to provide enough for the rising costs of living. Some moms are single and want to be home with their children. After reading the thousands of comments and many stories (even crying through some really sad ones), I’ve been thinking a lot about these women. As I was contemplating how best to empower SAHM’s with necessary information on how to make money from home, the thought came to me that MANY friends of mine who are all WONDERFUL SAHM’s work from home or while being a SAHM for the majority of the time. These are real women and excellent mothers who have all needed or wanted to contribute or provide for their families. They will be sharing their tips, tricks, how they got started, and advice for those who are interested in working a similar position. Please know that I truly understand how hard being a SAHM is. I also understand that it is a FULL time job! It’s so much more intense, time consuming, and emotionally draining… yet REWARDING than I could have imagined. By publishing this series I’m not saying that all moms need or should work. I understand that we all have different situations as well. I know that for a mom of 3 young kids its more difficult to find time than a mom of a newborn or of all teenagers. I don’t wish for any SAHM to feel guilty for NOT working. 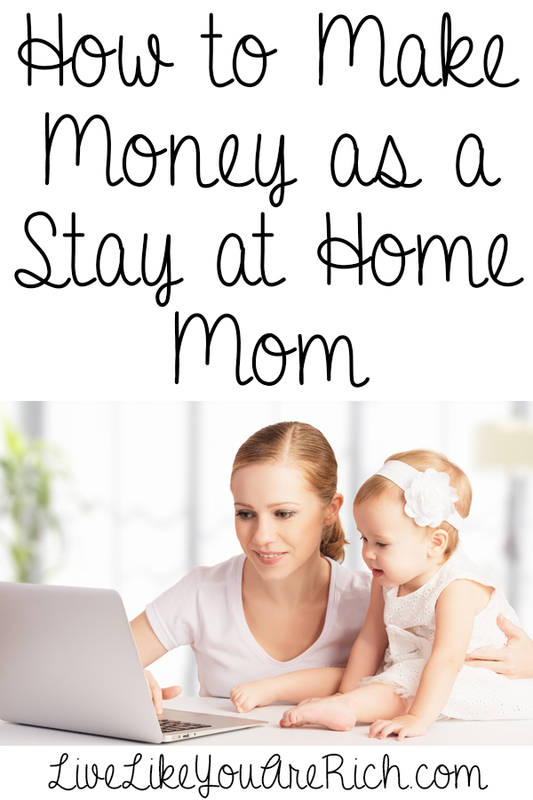 Studies show a SAHM contributes a LOT of monetary value just by being home. I am however, creating this series for the thousands of moms out there that expressed a desire and even an intense need to learn how to work from home. For more interviews please subscribe for updates and check back weekly because I will be featuring other Money-Making SAHM interviews on my blog as I arrange them. Also, if you are a SAHM who works from home and want to share how you make money, please comment below. I do moderately compensate those who contribute. Thanks! It has received amazing reviews and is helping mothers and all readers get out of debt, improve their credit score, save, invest, and become more financially secure. It has already helped moms teach their children how to develop a good work ethic, earn and manage money, and build their own credit score (even as a young adult). Ultimately, this book has assisted mothers in getting their children on the way to obtaining financial independence. Karen (co-author) and I understand how tough stretching income can get. In the book we reveal what we have been taught by our self-made-rich parents and grandparents about creating wealth on any income. The principles written about, if followed, will lead to financial security. If you have an Amazon account and a Kindle or the Kindle app, click here to own the Book. (Have an Amazon account but no Kindle? You can get the Kindle app for free here). Paperback coming soon. No Kindle/Amazon Account? No worries. You can still get the eBook delivered to your phone, tablet, or computer, by clicking here. For other ‘rich living’ and money making tips, please subscribe, like me on Facebook, and follow me on Pinterest. Amanda- Yes there are plenty of other examples and ways coming 🙂 If there is something specific I could see if I have that interview planned, if not I’ll look into getting one planned. Party rentals (bounce houses, tents, etc), pet-sitting and taking sales calls from home(Car rental places and selling life insurance are good ones.) There are countless ways for women to make money from home, but most are too scared to do it. Don’t be scurred! You can do it! Hi my name is kesha griffin I am interested in learning how to make money online I am a single parent with four children I am going to school this fall I know this will a great opportunity for me. Kesha- Congratulations on going back to school. Here is the post on how to start a business online. I will be posting more on other online jobs as the series continues as well! Tiffany- Thank you for reaching out. I am not promoting or featuring money-making moms who are doing multi-level marketing systems at this point (except maybe one that I’ve had experience with). I wish you the best and if anyone is interested they can click on your link you left to your website and contact you. I know this is different in different places (I happen to live in Alberta,Canada) but I run a Dayhome out of my home, and it’s been a great way for me to make what extra money my family needs while still being at home with my kids. Maybe you could do something on what being a Dayhome provider in different areas requires? Tiffany- This is wonderful. I actually have a next door neighbor that runs a daycare out of her home that agreed to participate but I would absolutely LOVE to have your perspective as well (especially since you are in a different country). Thanks so much for reaching out. I just sent you the questionnaire. I am super interested!! I’m a mother of 4 children under the age of 7. I would be working to pay for daycare if I chose a career out of the home. But with the price of just gas and groceries alone I need to bring in some sort of income to help. I’ll try anything that allows me to stay at home with my babies and not have to fork out cash like those tier marketing schemes. I can’t explain how grateful I am that you have chose this topic to series on. Thank you so much!! Bre- You are so welcome. I hope to feature an article that is something you can and would like to do to make an income while being with your children! I’ll be featuring 1 possibly 2 interviews each week. Thanks again for this sweet comment. If you do find something that works for you I’d love to hear about it. I am a mother of two teens. (one 18 and experimenting with living on her own off and on with a friend) and one 16 year old senior in high school (homeschool). I also have an 18 year old girl that lives with me who was a friend of my daughter that needed help for a while. I am a disabled RN and have not been able to work for nearly 9 years now. We have had times of struggle, but we have come thru okay. I receive disability now, but it is not much. I have homeschooled my children (one graduated over a year ago) since I stopped working. My biggest reason for wanting to start working from home is to keep myself SANE! With only one left ‘in the nest’, and him being very independent and rarely needing much of my time, and my husband constantly busy with his regular job, his part time business, along with keeping up our country home maintenance and all of our 5 vehicles…I get lonely and bored. My husband went so far as to get my business set up for me with the state and a lot of the little details that I need to have in place to begin, but I have held off. Maybe after reading a few more of your inspirational stories, I can finally find the confidence to begin! Heidim- I really do hope this helps you in your situation. The Airline representative may work as you have older kids! We have more to come though so keep checking back. Hello. I am excited that I stumble across your site while actually searching for a stay at home job. I am a disabled mother of a 6 year old and a homeschooler. I have a. B.S. degree in health services, counseling, and psychology. I live in a very rural area in Alabama and the economy, as it is elsewhere, is horrible. I am losing my mind simply being at home. I feel as though I am not contributing and I have no purpose. Of course I care for, raise and teach my daughter, however, I need more. I have to yet been able to find anything that I can do from home. I have no money to put into starting a business. My degree seems quite useless and I am praying that your series may offer me some sort of ideas and hope I have yet to find. Thank you so very much for choosing this particular topic to feature. Pamela- I hope you are able to find something that fits in with your lifestyle and schedule! Thanks so much for the kind comment. I wish you the best! Candice- I’m so sorry about your disorder. I really hope that you can find something useful from this series! I wish you the best! Thank you Misty I have sent you the questionnaire! I hope I can follow this and find a solution for my family. I am a young mom of three children. All three of my kids are under the age of six and all receive services ranging from ot pt speech TSS special education and development. My front door needs to spin from all the in and out I do taking them to dr and having specialist in the home. I am also trying to go to school on the evening to get a career once they are all in school. We are not making enough with just the one income from my husband, he doesnt make much, but I can’t see. To find a solution to make money on my end unless I quit school but for us to have a better future I need to finish… I at lose ?? Erin- There are many more series coming. Please check back and see if anything will work for your busy and tough situation. I wish you the best! Hi there, I found your site via Pinterest and I must say I am very happy I did. I’m a new mom (has my daughter on May 3rd) and I’m looking at options that will allow me to be home with her. While I’m not sure if any of the options can work for me since I live in the Caribbean (the economy is very rough here too), at least if anything you would’ve provided inspiration. So thank you! Cher- I’m so sorry! I found friends at church mainly, I’ve stayed in touch with one or two friends from high school, I try to be active on social media and leave kind comments on friend’s posts. It helps to be a friend in order to make one. I know it’s hard. I’m so sorry you are depressed! I went through Post Partum Depression and boy was it tough! The few months after the baby is born is hard. Give yourself some slack, but once you get feeling better get out to some activities and make friends. I don’t know if you want my advice but I find by being a friend to someone else who needs one is the best way to gain one :). If you want other ideas on how to make money from home, please check back I’ll be adding many more! Good luck and I wish you the best! I would love to hear about what you do! I would love to hear about a mom who has had success tutoring (online tutoring or in her home). I have tutored outside the home before I had a baby but now I want to do it again and I just need help figuring out how to do it. Any suggestions would be greatly appreciated! Thanks for all the great ideas on this site! Janelle- That is an interview I’d love to include in this series. Stay tuned. Thanks for the suggestion! Remember that mothers who have a full time job also have their family as the top priority. NOt all mothers are blessed with the choice to be a sAhm. Paige- When I said that I was writing it for SAHM’s who needed to earn extra money or moms who desired to become a SAHM who of course had their children a priority I did not mean to say that women who work don’t have their children as their priority. I believe that was possibly taken the wrong way. I am just speaking to a specific set of women. Thanks for pointing that out though. I love this article because it does a great job of providing stay at home moms who want to earn extra income some good ideas (and hopefully the inspiration) to go for it! It is definitely a tough thing to do, especially if you have small children like me (5 year old and 20 month old) since they are all-consuming of your time and energy. What I do have to say though is that we have opportunities now that weren’t around even 10 years ago. The absolute beauty of this day and age is that working from home (or anywhere for that matter) is completely possible as long as you have a laptop and a dream :). While on mat leave with my 2nd, I realized that I was DONE trading my time for money and was completely consumed with learning about all the different ways to earn passive income – generating streams of income that comes in regularly with little to no effort once you’ve started it up. I studied tirelessly (yes even during 3 a.m. feedings!) from successful entrepreneurs who have done this. There are a few cool opportunities I am embarking on, but the one that resonated with me the most was learning how to sell your own private label products on Amazon – I found an amazing course created by 2 guys who have learned to do it and it has honestly changed my life. While not for everyone, I encourage everyone to look at these kinds of opportunities – that working at home as a full-time parent does not preclude you from starting up a business that generates SIGNIFICANT income. It doesn’t necessarily take all your time – that’s the beauty of passive income! Audra- thanks for the tips, that is awesome that you have been doing surveys and making money in your spare time! 1) You can work PRN (as needed) once a week maybe, or two if you want more or even less sometimes if you aren’t needed. either way, its a good way to keep up your skills and license. 2) You can work from home. – Nurses in Sales and Marketing – Average Salary: Average base salary is $82,519 with $54,300 in commission and bonuses depending on the amount of sales produced. Total salary: $121,000. Brittany- Thanks so much for your comment. I bet it is exhausting, I can’t imagine! Thanks for leaving the Great info! I’m excited for your adventure in being a Stay-at-home mom. 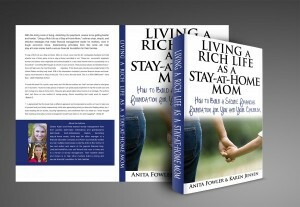 I’m actually publishing a book this month called: Living a Rich Life as a Stay-at-Home Mom: how to build a secure financial foundation for you and your children. Perhaps that will be of use when you got to make your life change. Thanks again and best of luck! Looking forward to seeing all the things that people do from home!! This is a great list! Personally, I hire two stay at home moms (graphic designer, proofreader) and a stay at home day (graphic designer) and I have a client who sells Norwex as her stay at home job. It sometimes takes a bit of ingenuity, but we all are successful outside of a corporate environment. Thank you for all the ideas! I am 3 months pregnant and my husband I agreed to pull me out of work and be stay at home mom. We could definitely use the extra income, a lot or a little, to support the baby! I will keep your article for the future! Very excited to be a stay at home mom and hopefully make some extra income. Thank you again! You are welcome. Great choice! I love being a SAHM! I wish you the best! Great ideas. So blessed to be able to raise my child and work from home. Thanks so much for the comment. So glad you can raise your kids and work from home! Hey Anita- God is good, I am very blessed to have made the leap from employee to work for myself and do what I love (web development/SEO), make a living at it (single mom) and tailor my schedule around my son. I have another idea I hadn’t seen on your list that is REALLY taking off for people in the Internet/Marketing arena. Social media posting. I find that many companies that are doing this are a bit tainted and charging too much. I actually found my own stay-at-home-mommy friend and trained her to do this for my clients (who LOVE her) and now she has a whole new skill set. Once a social media person researches the industry of the client enough and get’s fed bits and pieces of news/articles/etc, they can pretty much take care of it for the client. Hope this helps someone. When I had my daughter, I was so reluctant to have to go back to work and I decided to scour the internet til I found a legit work from home job that allowed me to spend time with my family and work on my time.No nagging bosses, no gas money wasted, no childcare costs. I love working from home!! Thanks for your feedback and experience Joanny. I love it too! Nice Site. I like no. 13. I have just recently got back into Blogging and am resurrecting some old sites from years ago. It’s very refreshing to do ! Great content is a necessity and you’re right Content is king. And I think it is important to Plan before you actually start blogging with Posts. Thanks Rob. That’s awesome you are getting back into blogging! Thank you so much for this information. I will be coming back for more as I work through your different ideas. You certainly have quite a lot of areas to consider. You’re welcome. I’m so glad you have found this helpful! Let me know if you have any questions. You’re welcome Brian! Thanks for stopping by. As a stay at home mom I recommend “Medical Coding and Billing” as a wonderful work from home option. Yes, you will need training. You can’t just code medical records without having proper training. However, this is a real and promising career. I used to work for “Career Step” and they have an awesome Medical Coding and Billing course. Just to give you an idea of how the online course is set up. Description: First let me say that I am a Christian first and a business woman second. My background is in mental health and never ever ever would I have considered starting a home business because I’m not a Salesperson….but my own health conditions and my wanting to lose weight to be a kidney donor for my father….brought me to try the product. I say this in good faith, I would never attach my name to a product or business that wasn’t well researched, reputable, or that didn’t deliver impressive results. After trying the product, I knew I had to get involved in sharing it with others. The support that comes with becoming a home based business owner with this company, comes with QUICK earning potential, INCREDIBLE commissions, and an EXPLOSION of support–had I felt alone, I would have been less inclined to step out and do this. This is a relatively new business that is attracting A LOT of demand and taking home based businesses by storm! Get involved as an entrepreneur for some amazing weight loss products including a great tasting weight loss coffee. Get your daily coffee fix and lose weight by doing it! We also have other weight loss products energy products that are bringing in OVERWHELMING testimonies of people experiencing the following benefits: fat burning, mood elevator, increased focus and mental alertness, diminished appetite, and reduces sugar cravings and absorption. Regarding Salary: We get paid 7 different ways; there are 5 ways we can get paid weekly and 2 ways we can get paid monthly. You become a business owner. The pay is commission and residual based. Residual income is different then temporary income (showing up for work). Residual income allows us to get paid over and over again for something we did once. We have the ability to build a business for 2-3 years and get paid for the next 20-30 years or more. Temporary income at work is doing a job, and getting paid for it once. Once we get paid once, we don’t get paid again until we do that job. Valentus has become a global business network and it is by far the easiest job I’ve had. Join me by following and checking out my link below and I can promise you–you won’t regret it! Very great tips, I also make money online doing something so simple. I take exotic vacations every 2 months. I’m so glad I am able to live this “passive Income” lifestyle I make a six figures a year just from marketing online I highly recommend it to you all! Here’s a link to get you started on making just as much as I do! http://tinyurl.com/jhfpklz Everyone have a great day! I was about to lose hope for my business is having a slugging growth than I expected. Thanks always for encouragement. Amazing. So many great ideas and all of them are effective. I try myself as a blogger and a SAHM and I hope you will visit my blog and read my posts, regarding job search, as well. I would love to tell other moms how I make money as a test rater! This involves grading tests for companies such as Pearson and Educational Testing Service. It is grading, not teaching, and is non-phone. I’ve been doing this for three years now, and it has been a blessing. It does vary by company, but the one I work for treats you as an employee. You are able to set your own schedule as well, which is a benefit for any mom I know. would be okay. I’m definitely enjoying your blߋg and look forward to new updates. Yes, here’s my twitter https://twitter.com/LivingRichTips. Thanks!